Although some time-tested principles remain constant, best practices in portfolio management demand an evolving set of methodologies due to various factors, including new styles institutions adopt, and government intervention in financial markets. For example, liquidity has greatly improved in recent years due to prevelance of high-frequency trading, which provides willing buyers and sellers at more price points, often at penny spreads. We are continually researching ways to increase profits and control risk. Let me take you on a tour of our research lab. One tool is a cloud-based Integrated Development Environment (IDE) where we can draw upon 670 metrics for the 5,008+ entities in the US public markets. The IDE includes a sophisticated backtesting engine where we can test investment theses over years of intraday price and volume data since 2002 up to the most recently completed business day. We have access to many curated data sets. One, of corporate events, is data on corporate share buyback announcements, CEO/CFO changes, clinical trials, FDA approvals, guidance updates, index additions, mergers & acquisitions, which we can use to determine if these factors indeed improve share price. We also have extensive data on gold, silver and other metals, priced in every major currency including the important Indian rupee, since India is the second-largest gold buyer in the world. Everything from gold coins’ comparative historical pricing to the difference between Englehard vs. Handy & Harmon gold bullion. There’s about a $100 difference per troy ounce betwen the two, for example. Other curated raw data sets include such disparate subjects as historical price data for other metals, agriculture, and energy all over the world. The Penn World tables, which give us purchasing power parity, income, population for 167 countries. a data collection of startups, venture capital, angel investors, and BLS data on new businesses. Other curated world raw socio-economic data sets for exploration: fertility rates, life expectancy, percent of hunger, age dependency ratios, populations affected by droughts, human development index, estimated corruption control, internet users, cell phone subscriptions, arms exports and imports, CO, methane, HFC, SF6 emissions. The universe of publicly traded investments has shrunk in recent years, as you can see from this chart. Represented by the blue bars in the chart, the number of public companies have declined from the 2000 internet crash. 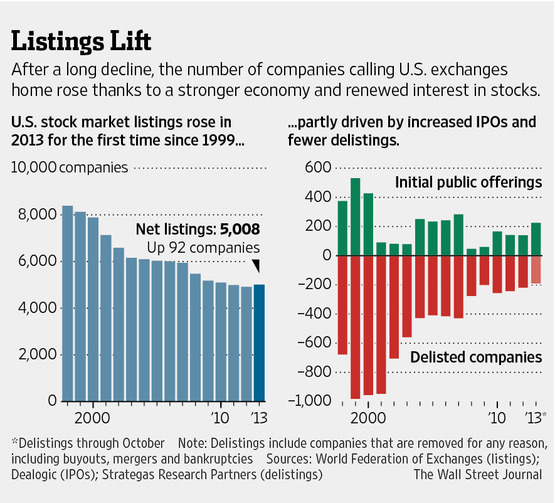 The red bars in the chart on the right are companies delisted in the aftermath of the crash -- thousands of companies. In our lab we have clean reliable, real price and volume data for all these companies. Most analysts who test investment theories use a database of current companies without the thousands of delisted companies, so their results have an illusory survivorship bias. Databases that omit securities that are no longer traded ignore bankruptcies and other important events, and lead to false optimism about an algorithm. We can test our investment theses on a complete database including delisted companies. In addition we have access to 670 measurements of a company, from cash flows to preferred share accretion, numbers combed and scraped from SEC filings. Here is the complete list. We also have tools to conduct walk forward testing, an important next step for a promising algorithm, to test for curve-fitting and historical bias. We also have a complete set of statistical tools. For any set of data, we can use these tools to tease out trends and anomalies. We have experts available who help with programming and analysis. Jess Stauth, Seong Lee are each excellent programmers at Quantopian. Jess served as Director of Quant Product Strategy at Thomson Reuters, where she served as a Senior Quant Research Analyst. At Thomson Reuters, she had a key role in the product strategy for QA Studio and worked closely with strategic partners such as Palantir Technologies. Prior to Thomson Reuters, she worked as a Quant Researcher at StarMine, where she played a critical part in researching and building stock selection models based on underutilized alpha sources such as short interest, insider filings and institutional ownership data. Dr. Stauth holds a PhD in biophysics from University of California, Berkeley and a B.A. in Physics from Colby College. She helps us with research and development for updating stock selection algorithms. Jess Stauth and I have coded the algorithm described in my white paper Superior Returns from Average Indicators . Another example one of our recent projects was to research companies which buy their own shares. This retirement of public float is a major trend in today’s markets, and I’m all for it. Seong Lee recently completed an interesting study on the effects of these share buybacks. A recent development is that we now have the capability to securely connect our tested algorithms with accounts at Interactive Brokers, and autonomously buy and sell securities. This is the future, which we are still beta-testing, and will of course notify you beforehand if we intend to begin using this with client accounts. Interactive Brokers has a program which constantly scans all the public electronic exchanges as well as eight dark pools for best pricing, NBBO, highest rebates, and in milliseconds directs our orders to the most favorable. We are not affiliated with Interactive Brokers and receive no compensation from them, known as ‘soft dollars’ in the money world. We use them to custody assets because they are the best, in our opinion and in the opinion of Barron’s magazine for four years running. Security is crucial, of course, when dealing with money. All the databases are stored securely in Amazon’s cloud infrastructure, in a huge secure server farm in Ashton, Virginia, with redundant backup elsewhere, where all of our proprietary research and algorithms are encrypted. Passwords are never stored in plain text. All communication between our algorithm program and our custodial broker is done through SSL encryption. Each account has two-factor authentication (2FA) which makes hacking it mathematically virtually impossible. We have an extra edge here, in that we also use the highly-secure Chrome operating system for this work, the most secure available, so secure (and obscure) that the majority of hackers don't even try. We hope you now have a clearer picture of the countless hours and immense behind-the-scenes work that goes into our portfolio management.